Islamabad, April 10: Pakistan Prime Minister Imran Khan has urged his Indian counterpart Narendra Modi to resolve the Kashmir issue and that the two nuclear-armed neighbours could only settle their differences with dialogue, the BBC reported on Wednesday. His comments came as India goes to vote in the general election on Thursday. The cricketer-turned-politician told the British broadcaster that peace with India over Kashmir would be "tremendous" for the wider region. "The number one tasks of the two governments is how are we going to reduce poverty and the way we reduce poverty is by settling our differences through dialogue and there is only one difference - which is Kashmir," he said. Asked what message he wanted to send to the Indian Prime Minister and his country, Imran Khan told the BBC that the Kashmir issue "has to be settled" and "cannot keep boiling like it is". 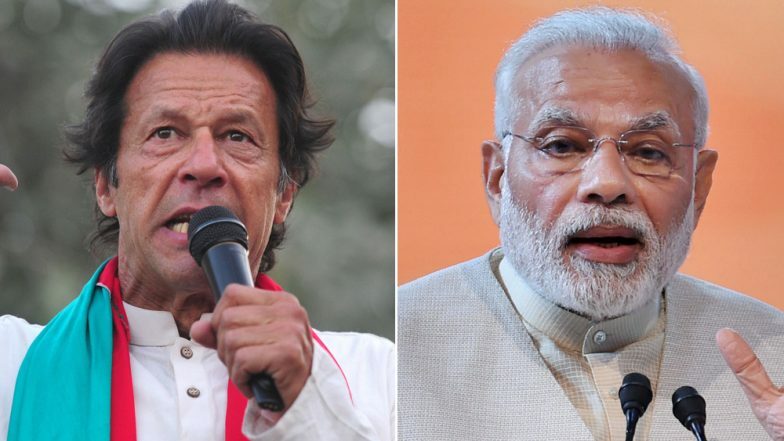 Pakistan PM Imran Khan Wants Narendra Modi to Win Lok Sabha Elections, Says 'Better Chance of Peace Talks If BJP Comes to Power'. Tensions between New Delhi and Islamabad spiked after a suicide bombing in Jammu and Kashmir's Pulwama in February killed 40 CRPF troopers and was claimed by Pakistan-based terror outfit Jaish-e-Mohammed. Imran Khan also spoke about the dangers of confrontation between the two neighbours, saying: "Once you respond, no one can predict where it can go from there."